SRT is recently completed a residence at Rodeph Sholom School in Manhattan. With a custom program designed to guide students into taking artistic risks in a safe and expressive setting, each class included a hands-on study of performance techniques for both improvisation and theatre. In addition to being a must for any aspiring star, life skills including self-expression, teamwork, leadership, spontaneity, and creative thinking are invaluable to everyone. 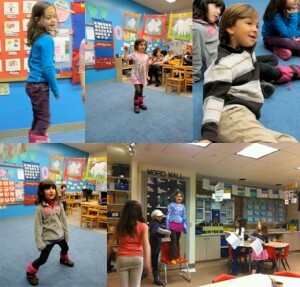 Classes at Rodeph culminated in an age-appropriate performance shared with parents and caregivers. Additionally, SRT’s director of education, Julianna Jaffe, recently taught at Wagner University. The workshop focused on movement as a pathway for self discovery and personal transformation… fusing the knowledge of kinesthetic awareness and view points. Students practiced exercises derived from Kristin Linklaters’ work with drawing visuals from the voice, incorporating movement. For more information, visit IN SCHOOLS.